I deemed today an "in the garden" day because I HAD to fill up the green cans before tomorrow's pick-up. I also had to do some painting and caulking on the almost-completed deck. I finally ran out of things to put in the green cans (when does that ever happen?) and my finger was sore from spreading caulk along the seams of boards. So I came inside and managed to sneak in some studio time as the sun was going down. It was such a glorious spring day to be outside working that I wanted to somehow capture how it felt in an art piece. So I took a photograph that I shot of the cute red gerberas in the workshop windowbox and turned it into a digital "painting" with Photoshop and a couple of fun textures. And I liked the finished result so much, that I've made it available in notecards at the Dusting in Pearls online store. Not bad for an "in the garden" day. Now I can go collapse on the sofa and nurse my slight twinge of a headache while Hubby cooks us a late dinner. Beautiful. Sounds like an awesome day! I was stuck indoors all day having to be content with leaving nose prints on the window glass. Awsome photo. It looks like a painting. Your note card is fabulous. Those Gerberas are beautiful! I planted orange Gerberas in the black urns in front of my porch this year! I took a pic and I'm currently using it as my header on my blog-check it out later! Gerbera daisies... my favorite. Beautiful art! 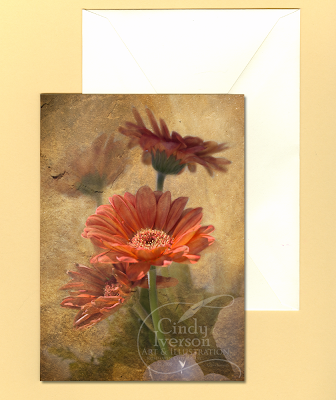 You know how I love gerber daisies...and the red is my favorite too...I think!